Rapid growth and increased acceleration of display applications market has been driving the market for laser diodes for several years. Over the last few years, the market for diodes has witnessed noteworthy changes in terms of output enhancement and scope in various industries. Continuous wave based laser diode is one of the key markets in the laser diode industry and is growing profusely as a result of its introduction in applications such as consumer electronics, defence/aerospace, telecommunications, industrial, etc. 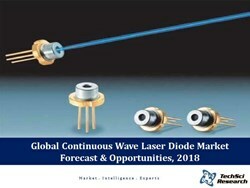 According to a recently published report by TechSci Research “Global Continuous Wave Laser Diodes Market Forecast & Opportunities, 2018”, the global continuous wave based laser diodes market is expected to cross US$ 5.9 Billion by 2018. Increasing applications such as Pico-Projectors, Head-Up Display, Biomedical Instrumentation, Blu-Ray and Gaming Consoles are expected to drive the market for continuous wave laser diodes globally. Osram Opto Semiconductors, Coherent, Newport and Nichia are the leading players in the laser diode market. The continuous wave based laser diodes are being deployed for material processing, telecommunications, storage devices, laser pointers, etc. Global continuous wave based laser diodes market is expected to see dramatic changes over the next five years because of the increasing applications in consumer electronics and defence sectors. Emerging applications such as head-up display and panels in automotive market are also contributing significantly to the growth of laser diodes market. “Green laser diodes are the newest technology in the continuous wave based diode market and the market is still at a nascent stage. During the next five years, it is expected to be the fastest growing segment in the laser diode market because of its increasing usage in head up display and Pico projector applications. These diodes are capable of providing more polarized output and this segment’s growth is likely to be driven by the growth in automotive, consumer electronics and defence applications”, said Mr. Karan Chechi, Research Director with TechSci Research, a research based global management consulting firm. “Global Continuous Wave Laser Diodes Market Forecast & Opportunities, 2018” has analyzed the potential of laser diode market and provides statistics and information on market sizes, shares and trends. The report will suffice in providing the intending clients with cutting-edge market intelligence and help them in taking sound investment decisions. Besides, the report also identifies and analyses the emerging trends along with essential drivers and key challenges faced by the industry.